DESCRIPTION Buyer's Notice - $400K! Wonderful family designed 4-bedroom 2-story home! *Rare Walkout & attached Garage* The residence effectively uses 1833 sq ft of living space! The main floor living areas include an open family room, front foyer with 2 story ceilings, 1/2 bath, good sized kitchen & nook combo! The main floor family room also features a gas fireplace with a white mantle/tile details. Plus there's lots of entertaining room in the kitchen/nook area, which features classic maple cabinets doors, GRANITE, wall pantry, island with sink & storage. Plus quick access to the large upper rear 21x 12 deck with stairs to below. The west facing sunny back yard is fully landscaped with a big 22x13 patio, shed & with lots of play area, you'll appreciate the extra room plus the rear lane access. And WOW! Upstairs features three good sized bedrooms and open to below staircase & 2 full baths. The master bedroom has high vaulted ceilings, big walk-in closet & full ensuite. Act now... Flexible possession date available! Home for sale at 9 Covewood CL Ne Calgary, Alberts T3K 4Z7. 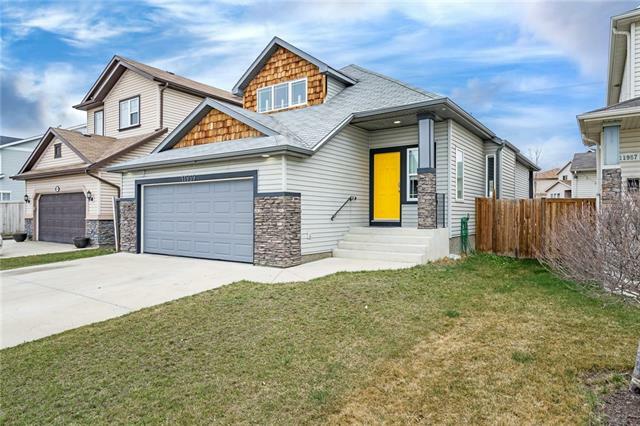 Description: The home at 9 Covewood CL Ne Calgary, Alberta T3K 4Z7 with the MLS® Number C4229444 is currently listed at $399,900.